Sometimes, it just doesn’t happen. 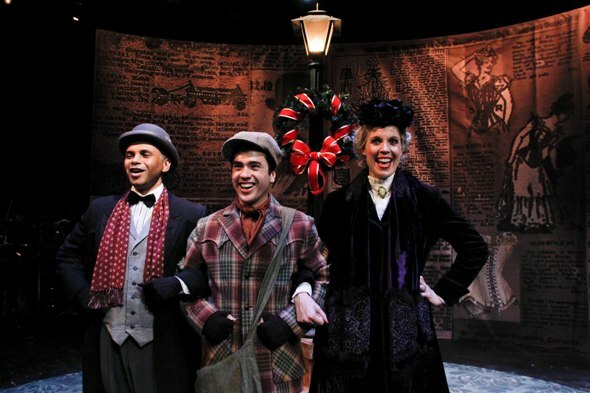 A show that looks like a natural – and what could be more inherently appealing that a musical fashioned from O. Henry’s poignant Christmas love story “The Gift of the Magi”? – somehow never musters the magic, never pulls us out of our seats, out of ourselves and into that rarefied place of tender irony. Porchlight Music Theatre’s earthbound production of “The Gifts of the Magi,” a 1985 confection with music by Randy Courts and lyrics by Mark St. Germain, disappoints in myriad ways, like a bulging Christmas stocking that turns out to be stuffed with coal. In that second tale, set like “Magi” at Christmastime, the homeless character Soapy Smith tries to get himself arrested and jailed so he’ll have a warm bed and hot meals for the winter months. But as it is the season of compassion and generosity of spirit, he can’t get a cop to collar him. 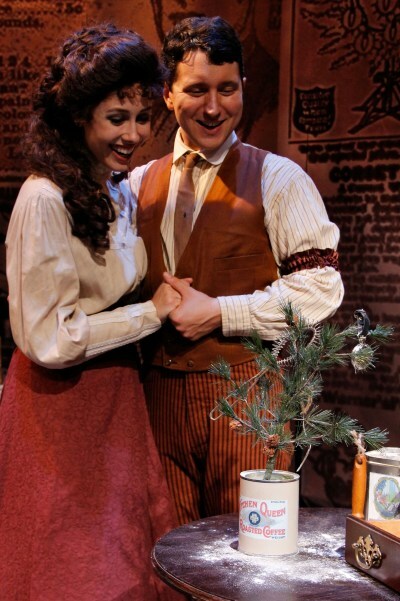 Though Soapy’s happy end may explain how O. Henry’s singular “Gift” became this musical’s “Gifts,” the bum’s merry chase has no bearing at all on the vicissitudes of the poor couple in view, Jim and Della Dillingham. Jim spends his days in a fruitless search for employment and Della tries patiently to keep his spirits up. Forging a link – in the metaphorical sense of iron-mongering and the literal one of counterfeiting – between the two stories is the task of one Willy Porter, who serves as both narrator and Greek chorister. This whole contrivance is further elaborated in the multi-functional persons of single male and female actors who portray The City, in all its inhospitable and daunting aspects. Mash-up that it is, “The Gifts of the Magi” still might work with a more accomplished cast of singing actors, more imaginative directing and choreography. Jason Richards’ wooden performance as the desperately unemployed Jim Dillingham gives Chelsea Morgan’s Della very little to play against; the vitality Morgan brings to Della early in the play erodes into clichéd exhaustion as the couple’s circumstances grow steadily worse – the very place where serious acting, and more attentive directing, should lift the story. Still, the weaknesses of this show are intrinsic. If neither Richards nor Morgan displays the vocal wherewithal to give their songs wing, it’s also true that the music and lyrics seldom rise above the banal. The same applies, even more pointedly, to the featureless acting and overmatched singing of Heather Townsend and Gerald Richardson as The City pair. The strongest vocal effort – and most engaging personification — comes from Nate Lewellyn as the narrator-chorus-town crier Willy. On a parallel track, like a character who has wandered into the wrong play, Kevin McKillip’s bum Soapy is a sly clown, agile and savvy, larger than life. But what’s he doing here, besides taking our attention from a touching story that should be plunging inexorably toward its bittersweet end? Far from bridging this misalliance, director Mark E. Lococo exacerbates it. 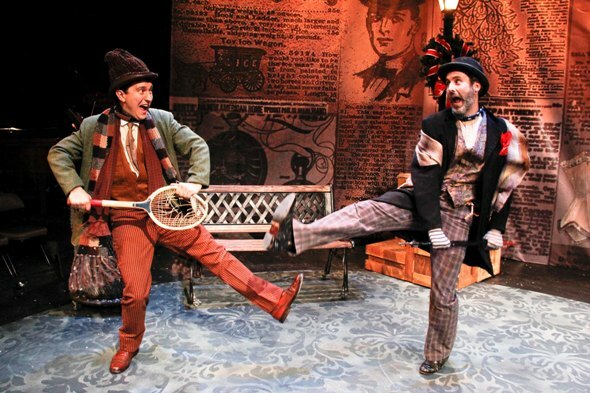 McKillip’s song-and-dance numbers are circus acts; the rest of the show is humdrum. Bill Morey’s early 1900s costumes are a plus, in contrast to the cheap aridity of William Boles’ set design. O. Henry’s “The Gift of the Magi” is a morality tale – or, as the title suggests, a parable of the meaning of true faith and irreducible devotion. This muddled enterprise isn’t up to that simple message.